pacho,i always admire your commentaries.They (including this one)are usually incissive,well researched and so refreshing.but with the current state of affairs the article seems alitlle bit ill-timed.lets put our efforts and focus on the league,how we can redeem our battered selves and also how we can do some house cleaning.nevertheless a good read ,but lets reserve it for another day. 1. When a coach does not listen to the funs….. I urge ZEDI to take note. The funs are saying Gor is not at best, no one is taking notice. When you listen you will save us the humiliation. 2. When a team losses you do not riot. Asenal funs just got pain killer to deal with the problen mated on them by Wenger. ZICO?WHY DO YOU CALL THIS MAN ZICO.HOW CAN A DEFENDER BE CALLED ZICO.DOES THE KIND OF PLAY EXHIBITED COME ANYWHERE NEAR THE ONE DISPLAYED BY THE LEGEND? LETS FACE IT ,SERIOUS ENTITIES GO FOR SERIOUS PERSONNEL WITH PROPER QUALIFICATIONS AND TRACK RECORDS.ASSUME WE WIN THE LEAGUE THEN WE ARE GIVEN APR AGAIN OR ANY TOP SUDANESE TEAM,DO WE STAND A CHANCE? THE MATCH BETWEEN ULINZI AND ZAMALEK AT NYAYO VIVIDLY ILLUSTRATED HOW A COACH CAN TURN A TEAM ROUND AFTER JUST ONE HALF-ULINZI WE THRASHED 4-0 WITH ALL GOALS COMING IN THE SECOND HALF.WE AS A CLUB HAVE DECIDED TO CLOSE OUR EYES TO THE REALITIES OF MODERN FOOTBALL WHILE DISPLAYING MEDIOCRITY AS FANS OFFER ALL THE SUPPORT -MONETARY AND ALL.THE PROBLEM IS THOSE WHO PUT ZEDDY TO THAT POST.AS LONG AS THEY GO FOR CHEAP THEN WE MIGHT AS WELL GET USED TO THE RESULTS WE ARE CURRENTLY POSTING. This is an excellent article. Thank you we need more articles like this to inspire our current crop of players. For me I have been very depressed about Kogalo and I needed something to remind me of the good days. So thanks for this. Current players should know that only inspirational players earn nicknames from fans. I thank the editor for taking us down memory lane. Indeed players earn nicknames from their fans. Perhaps to start with my nickname is Goodluck. I got this name from my peers while still in school. Somehow they said I have a sheer stroke of goodluck. Back to GM, our wonderboy Lavatsa is soon going to earn a nickname. The boy’s dribbling skills ,pace & fighting spirit is unparalled. Let me suggest a name. Zidane, after the legendry French international forwar who mesmerised the world with his wizardry dribbling skills. Remember Jogoo was also known as “Akuru”.So far Gattusso and Eric Masika are the only players in the current squad who deserve nicknames. Does Zico ever take time to look at Videos of Kogalo’s past matches e.g those of the eighties. 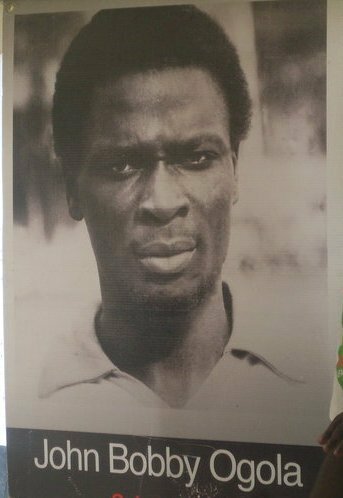 Guys do you still recall the goal Abbas Magongo “Orieko” scored against Esperence in Tunis in 1987. The same strike was later to be repeated by Zinadine Zidane when Real Madrid beat Bayern Munich in the Euro Championship cup final in 2001. Am sure Zidane learnt something from that Abbas Magongo strike and this confirms the potential of Gor as a mighty team. what about Antony Ndolo suzuki/pikpiki? Welcome to the latest Gor Mahia Fans Base housed at RUSH HOUR RESTAURANT along River Road opposite Kipepeo Hotel.Where lake dishes are sold at half price to K’OGALO fans donning the club jersey on MATCH DAYS. You’ll also watch your fovourite team on giant screen as they play. 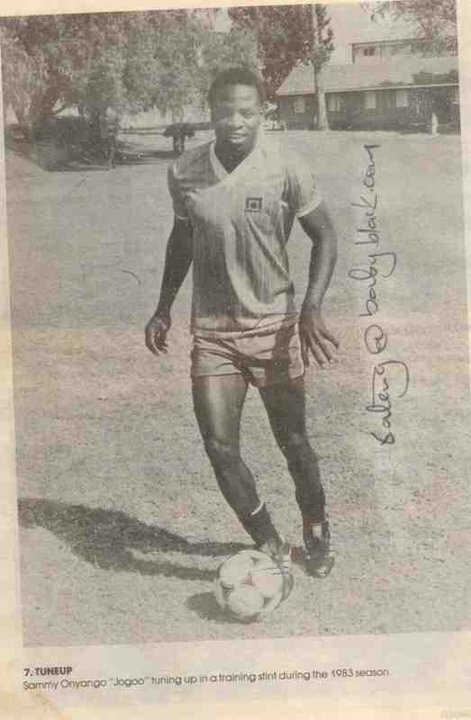 john ogolla – ‘bobby’ this was the nickname. bobby was after the england no. 4 bobby charlton. six million dollar man was given to him in ref to free kicks.